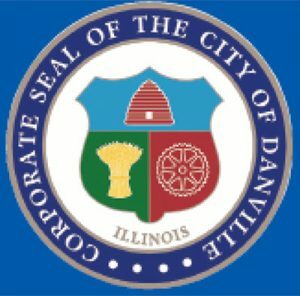 Home→City Seal→City Seals: Danville, Ill. It is not always easy to distill the diverse industries of a municipality into a single seal, but Danville, Ill., has done just that. ffice was established the following month and city fathers Dan W. Beckwith and Amos Williams drew up a plat map. Agriculture was a vibrant component of the community’s economy. Later, Danville became a major industrial city in the late 19th and early 20th centuries. The rail yard consisted of machine shops, switching yards and a roundhouse capable of simultaneously servicing 15 steam engines. For a time, Danville was home to Western Brick Company, the largest paving brick manufacturer in the world, and several buildings, including the football stadium, at the nearby University of Illinois, were constructed of that brick. Western bricks were also used to lay the track at the Indianapolis Motor Speedway. But the overall meaning is clear: Danville stands as a monument to the balance of agriculture and industry in the making of a robust town of honest laborers in America’s heartland.